So you have made the big decision to reside your home, but aren't sure what affects your end vinyl siding costs. Like any commodity on the market, supply and demand is one factor that impacts your final price. 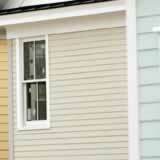 First, vinyl siding is made from a PVC (polyvinyl chloride) plastic resin. Approximately 76 percent of PVC is used in building and construction. The overall low-end cost of PVC allows manufacturers to pass on saving to contractors and homeowners like you. Second, installation costs affect your budget. Most siding companies work year-round, but if you are looking for a deal, fall and winter are usually the best times to install. Contract work slows down and prices on labor and materials become more competitive. Your vinyl siding job is also completed quickly as contractors have fewer on-going projects. Don't worry, vinyl siding companies can compensate for temperature adjustments required with installing in colder weather. Factors such as natural gas prices factor heavily, since it is the key ingredient in the making of PVC, fluctuations in natural gas prices will directly influence the price of PVC. Traditionally a steady and abundant supply of natural gas meant that it was not a significant contributor to price fluctuation in the market. But keep your eye on rising prices for natural gas as an alternative in heating; this may affect the competitive edge on vinyl siding costs. It's not obvious, but vinyl siding cost is directly affected by economic and global events. In addition to natural gas, oil prices can filter back to manufacturers, affecting transportation and production costs. Labor and weather also affects the end cost to the consumer. If the demand increased without production, the inflation of vinyl's siding costs would be eminent. Other vinyl siding cost factors include removal, which runs $1,000-$3,000. Ask your contractor or manufacturer if they recycle. If enough contractors recycle, their effort might contribute in an overall decrease in costs. The written contract should include a final price for the whole job, materials to be used, dates within which the project will be done and the manufacturer's warranty. This will lock in your final vinyl siding costs and leave nothing to question when your vinyl siding project is finished.